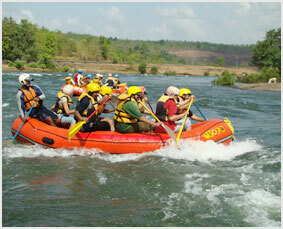 The snow-fed and gushing rivers of Himachal Pradesh serve as the perfect option to enjoy rafting in the entire state. Also referred to as Whitewater River Rafting, the water sport offers an exciting thrill that can run a chill through your spines. Counted among some of the best rivers for rafting in the world, the upper Himalayan region is a must for those who wish to challenge the confinement of their daily life. The untamed rivers that came gushing and cuts against stony banks, crash into rocks, breaks into water rapids, swirls and fall in a thunderous blare will surely make your heart skip a beat. Chandrabhaga or Chenab, Satluj near, Ravi near and Beas River offer some electrifying rafting possibilities to travelers in different parts of the state like Lahaul, Kullu and Shimla.